Peter Goodwin was born in Sydney and introduced to the bush from an early age, collecting maidenhair fern in bush near his grandparents’ house in Bankstown, and going on picnics and bush walks in the national parks around Sydney. Always fascinated by plants, he was keen to try and understand how they worked. After completing a Bachelor of Science in Agriculture at Sydney University, and then a Masters, he went overseas, to Nottingham University, to complete a PhD. The PhD led to postdoctoral positions in Dundee and Canberra, and finally a lecturing position in the Faculty of Agriculture at Sydney University in 1974, and Reader in Horticulture in 1986. Peter retired in 2001. 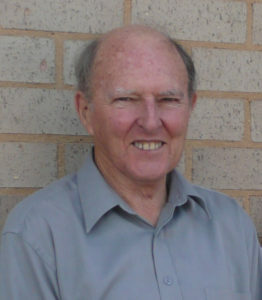 Peter began research on native Australian plants in 1981. He carried out work on the fertiliser requirements of a number of species, on the screening of genera for those of ornamental value as cut flowers, flowering pot plants, foliage plants or bedding plants, and on methods for the efficient production of likely species. Disease resistant, compact types of kangaroo paw (Anigozanthos spp) were bred, which have gone into commercial production. Superior waratah (Telopea speciosissima) clones were identified and registered for Plant Variety Rights. He worked on export technology for Blandfordia grandiflora and Telopea speciosissima and on the control of flowering in Anigozanthos, Blandfordia and Telopea. Work on the mechanism of seed dormancy in flannel flower (Actinotus helianthi) was funded by a grant from the Australian Flora Foundation. Since retirement Peter has been able to more effectively support the Australian Flora Foundation, and has lead a team including Ian Cox and the late Val Williams and Bill Payne in developing the website for the Foundation. This has enabled the results of the research funded by the Foundation to be readily available to the public.